Darkness still blanketed the city of Charleston in the early hours of May 13, 1862, as a light breeze carried the briny scent of marshes across its quiet harbor. Only the occasional ringing of a ship’s bell competed with the sounds of waves lapping against the wooden wharf where a Confederate sidewheel steamer named the Planter was moored. The wharf stood a few miles from Fort Sumter, where the first shots of the Civil War had been fired just a little more than a year before. 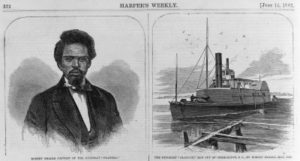 As thin wisps of smoke rose from the vessel’s smokestack high above the pilothouse, a 23-year-old enslaved man named Robert Smalls stood on the deck. In the next few hours, he and his young family would either find freedom from slavery or face certain death. Their future, he knew, now depended largely on his courage and the strength of his plan. Like so many enslaved people, Smalls was haunted by the idea that his family—his wife, Hannah; their four-year-old daughter, Elizabeth; and their infant son, Robert, Jr.—would be sold. And once separated, family members often never saw each other again.